Published in the series, Sociology of Crime, Law and Deviance, Volume 16. Bingley, UK: Emerald Group Publishing, 2011. This volume addresses a variety of issues related to economic crisis in the broadest sense of the term, involving diverse national and international contexts, historical epochs, and a range of problems related to economic life. 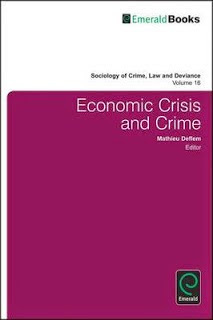 The chapters in this volume tackle criminologically relevant questions in connection with crime/deviance and/or the control thereof, on the basis of an analysis of any aspect of economic life, in general, and economic crisis, in particular. Thematically diverse within the province of criminology and the sociology of crime, deviance, and social control, the chapters are not restricted in terms of theoretical approach and methodological orientation. In these and all other relevant respects, this book is usefully varied in examining selected dimensions of economic crisis in relation to important questions of crime and crime control. Specific themes discussed include: corporate crime, money laundering, foreclosures, and mortgage fraud. This book provides timely analyses of the impact of the current economic crisis, innovative perspectives on problems of economy and finance, and criminological insights on often neglected aspects of social life. Students and scholars in criminology, sociology, economics, criminal justice, and other relevant social sciences will find much food for thought in these pages and, hopefully, discover insights relatable to their own investigations. Published in the series Sociology of Crime, Law and Deviance.